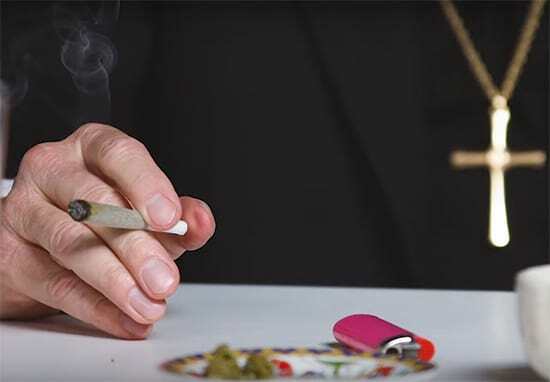 Some churches don’t maintain the pretense of being a religious organization past their storefront, and use it to skirt the $200,000 dispensary start-up fee. Ask any Rastafarian, and you’ll find that worshipping with cannabis is nothing new. But that hasn’t stopped a wave of neo-ganja zealots from opening up their own churches dedicated to the herb. Places dedicated to the mysticism of cannabis consumption have cropped up across the country: in Denver, San Jose, and Indianapolis among others. And while many of these places have gone through the trouble of becoming certified religious organizations and maintaining amicable relationships with local police, some of them have been getting into trouble for not following the rules. Reverend Heidi Grossman of the Sugarleaf Rastafarian Church in California didn’t arrive to a hearing where the court was meant to judge on her church grow-op. A month later Grossman, who had brought a Chihuahua in a pink stroller to the initial hearing, was arrested along with 17 other people for growing without a permit. On November 15 police seized roughly $25,000 from an illegal dispensary in La Puente, California that had been masquerading as a church. And while Grossman claims that her operation is wholly spiritual, some places don’t even maintain the pretense that they’re a religious organization—at least not past their storefront. Like Grossman’s church this one, the Citadel Church of La Puente, didn’t have a permit—at least not to sell weed. It was actually “licensed to repair cell phones” while holding a few pounds (only four or five), edibles, concentrates, a scale, surveillance equipment, and under $300 in cash. Police claim that the marijuana products have a value of “between $20,000 and $30,000.” Following the police’s three-week investigation a “known gang member” was arrested, cited, and released at the scene along with one other person. One man was detained and then released without charge. Of course, it’s easy to just assume that these churches were set up to flaunt taxes or flagrantly disobey state law. And while this certainly may be the case, the situation is possibly also representative of the fact that the black market is being at least partially buoyed by entrepreneurs facing a high financial barrier to entry for the industry. In California, fees to open a dispensary run anywhere from $100,000 to $200,000, which may or may not include required startup capital or liquid assets. Major dispensary brands can have huge capital arms that make it difficult for small stores to compete. The ballooning brand MedMen, for instance, has an ever-growing investment fund of $250 million (up from $100 million last year). In California, fees to open a dispensary run anywhere from $100,000 to $200,000. It’s not that this is entirely what’s driving dispensaries underground, but compounded with how it can be nearly impossible to get a loan for a marijuana business this whole set of financial requirements, and the monetary landscape, in general, can be prohibitive. If we are really trying to make moves to close down the black market, we will have to consider the nature of what dispensary owners are asked to provide and own as a prerequisite for running their own businesses. We need to ask whether groups that would otherwise be participating in the underground market can actually afford such things. Otherwise, we both maintain underground weed sales and block out swathes of the community from being able to afford to participate in a market where large businesses with huge investment arms have long been working.